Located on the edge of Vancouver’s burgeoning design-driven Armoury District, Kahve elevates the city’s cross-cultural aesthetic. The Turkish word for ‘coffee’, that migrated to Italy and became ‘café’, its Vancouver incarnation is part coffee shop, part showroom and was opened by Korean art critic John Rhee and designed by Japanese-Canadian architect Eitaro Hirota, with a zen meets Scandinavian sensibility. And while the neighbourhood is fast becoming a café hub, Kahve’s sleek interiors sets it apart; constructed by a craftsman trained in traditional Japanese carpentry, clean minimalism is expressed through a palette of Douglas fir timber, polished concrete flooring, quartz countertops and an all white interior that amplifies the space and drenches it in light- even on rainy days. 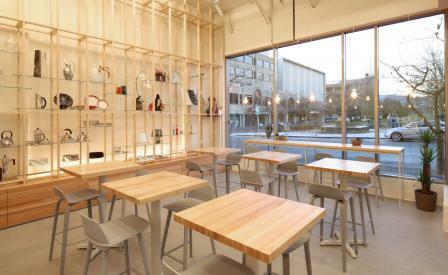 A prominent maple display wall featuring an array of Alessi coffee making equipment and George Jensen homewares was made using traditional Japanese joinery, referencing the wooden ‘Koushi’ screens seen in the Kyoto Machiya storefronts. The lighting and furniture by Muuto are also for sale. Viewed from outside, the wall makes it appear as if patrons are part of the window display. For the chic single-origin coffee connoisseurs in the ‘hood, Kahve is quite literally the place to see and be seen.